Also, from the month of September of 2007, my rising sign isn’t Scorpio anymore, but Sagittarius. And this applies also to Venus, which is now in Sagittarius, and Mars, which from January 2008, is in Scorpio. 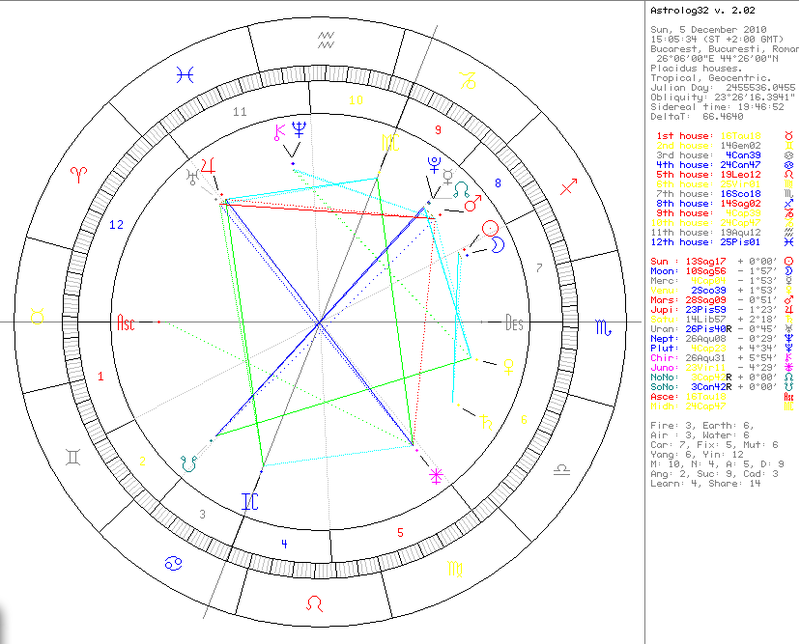 But the most important thing, is that on the 22nd of May of 2011, my progressed Moon will be in conjunction with my natal Moon, and this is something that happens for the first time in my life. 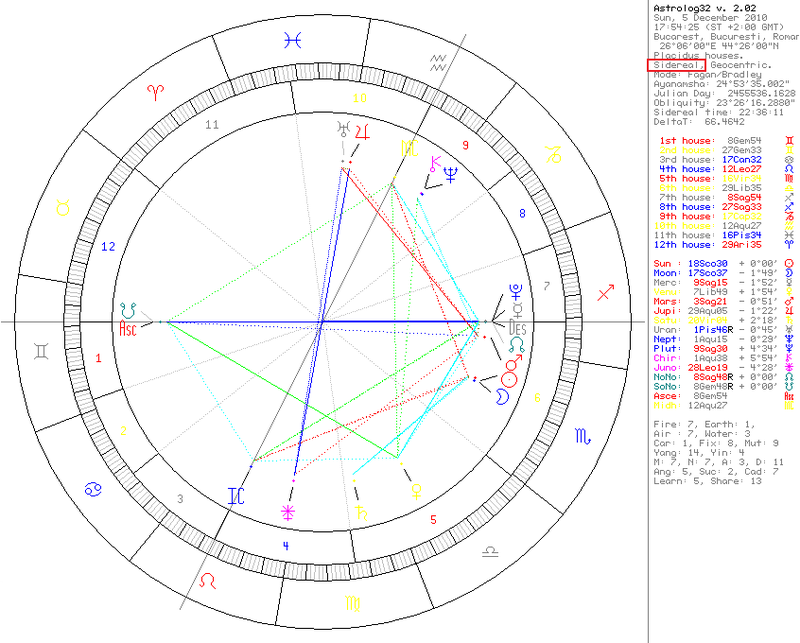 And this time is better, because with the Sun in Capricorn, this Taurus Moon is in trine… so my conscious will seem to understand my subconscious and they will work perfectly together! Doing the same with my rising sign, I see that it will leave Sagittarius, to enter Capricorn on the 5th of August of 2044. Yeah, I also know, this calculation may be useless, considering the movement of the planets and their progression in decades and centuries, since what we celebrate to be the Sign of Sagittarius, for example, the Sun doesn’t “pass” through the Constellation of Sagittarius anymore… or at least this is what I’ve heard some time ago and I really want to see if it’s true. I mean, check this out… astrology is founded on the hypothesis that the Sun orbits around the Earth, projecting itself over each of the 12 Constellations that are dividing its orbit… but actually, this is just a mirror seen from the Earth, since WE are moving around the Sun. Anyway, with a little help from the Astronomic Observatory, only by seeing the map of the sky for December, seen from Bucharest, I’m beginning to feel very disappointed by the discrepancies between my ephemeris program and the real map of the sky! Check it too, Uranus is conjunct Jupiter, but they are not where they are on the astrological map of the sky, they’re between the Constellation of Aquarius and Pisces, at the beginning of Pisces, and not at the end of Pisces, preparing to enter the Constellation of Aries!! Thing that can also be applied to Neptune… and if I start to look out on a different astronomic map, I’m sure it applies also for Saturn. Update: After I’ve been studying and studying all day about this, I found that I only had to adjust one setting on my astrology program to show the same thing as the real sky: Switching from the Tropical Zodiac to Sideral Zodiac. And this is the map now. And now I have to start all over again, calculating my whole life based on the Sideral Time… :(( Which makes me a Sagittarius Sun with Libra Rising (+Venus+Saturn) and Taurus Moon… and Virgo Mars and Sagittarius Mercury… ok, so astrology has become too relative for me to still relate to it. I definitely have to find a more stable science. This entry was posted in Writings in English and tagged astrology, astronomy, constellations, progressions on December 5, 2010 by Stefania.